Looking to manage your project tasks in one central location? Look no further! 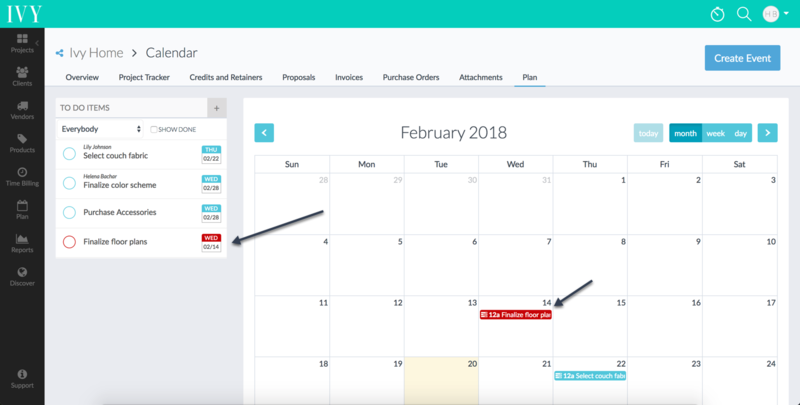 Ivy has the ability to manage your To Do Items for each individual project, and each item can be assigned to a team members, include detailed information, and have a due date that automatically shows up on your calendar! To create a new To Do Item, go into your project and select the "Plan" tab. You will see your calendar on the right hand side, and your To Dos on the left. To create a new To Do, just click on the "plus" sign at the top of the list and enter the relevant information in the popup. When you create or edit a To Do Item you'll notice that you can set a due date. Once a due date is set, an event will automatically be created in the calendar, allowing you to better schedule your tasks. If a due date has passed and the To Do list item is not complete, you will notice that both the calendar even at the To Do Item itself will turn red, alerting you that the item is past due. Marking a To Do Item as done! To mark a To Do Item as done, simply click the circle to the left of the To Do Item name. This will automatically remove the related event from the calendar, allowing you to focus on your remaining items. To view completed To Do's, just click on the "Show Done" checkbox at the top of your list. To filter a list of To Do items to view only your items, or those assigned to one of your team members, simply click on the drop down at the top of the list and select the relevant name. You can also view a full list of all To Do items by clicking on the "Plan" option in the left side navigation panel. From here, you can filter by project, or select to view all of the items assigned to one specific person.